The 73rd session of the UN General Assembly will open at the UN Headquarters in New York on September 18 and the General Debate will be held on September 25. State Councilor and Foreign Minister Wang Yi will head a delegation to attend the General Debate and deliver a speech. He will expound on China's stance and proposition on the current international landscape and major international and regional issues, demonstrate China's resolution to maintain multilateralism, uphold the authority and role of the UN and promote world peace and development along with other UN members. At the invitation of Foreign Minister Miguel Vargas Maldonado of the Dominican Republic, Guyanan Vice President and Minister of Foreign Affairs Carl Gary Greenidge and Surinamese Minister of Foreign Affairs Yldiz Deborah Pollack-Beighle, State Councilor and Foreign Minister Wang Yi will pay official visits to the Dominican Republic, Guyana and Suriname from September 20 to 23. They will exchange views on bilateral relations and other issues of mutual interest. The Foreign Ministry and the People's Government of Shandong Province will hold a promotion event here at 9:30 am on September 20 under the theme of "China in the New Era: New Shandong with New Growth Drivers, A Win-Win for the World". State Councilor and Foreign Minister Wang Yi will deliver a speech. Party Secretary Liu Jiayi and Governor Gong Zheng of Shandong Province will also address the event. Representatives of foreign diplomats in China are invited to make remarks and interact with the guests. In recent years, Shandong Province has firmly followed through on new development concept, advanced the supply-side structural reform in an in-depth way, taken the lead in replacing old growth drivers with new ones, vigorously boosted high-quality economic development and scored important achievements. It has also set a good example in building a province with strength in ocean industries, emerging as a new front-runner of opening-up, implementing the rural vitalization strategy and carrying forward the fine traditional culture. We believe that this promotion event with focuses on Shandong's shifting from old growth drivers to new ones, economic transformation and upgrading and continuous expansion of opening-up will showcase the province's long-standing historical and cultural appeal and development potential.We look forward to your attendance at and coverage of this event. Q: The ROK-DPRK summit will be held in Pyongyang tomorrow. What are China's expectations for it? A: We have noted that the ROK and the DPRK officially launched their joint liaison office last Friday, on September 14. We extend our sincere congratulations on that. The staff from the ROK and the DPRK will work in the same building and talk face-to-face on a regular basis, which, I believe, is meaningful for the two sides. The launching of the ROK-DPRK joint liaison office is another positive step taken by the two sides to implement the consensus reached at their leaders' summit and the Panmunjom Declaration. It can help the two sides continuously consolidate mutual trust, improve their relations, promote reconciliation and cooperation and create enabling atmosphere for the upcoming summit in Pyongyang. 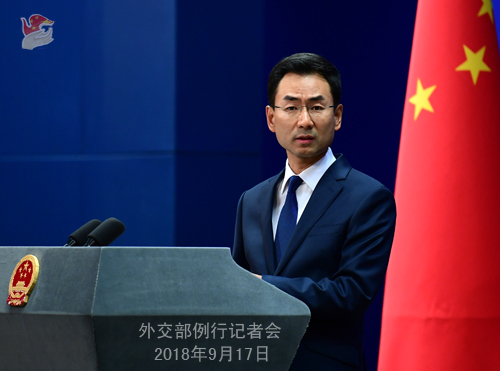 The Chinese side hopes that the ROK-DPRK summit in Pyongyang can achieve positive outcomes and play a positive role in strengthening the coordination and interaction between the ROK and the DPRK, sustaining and consolidating the improving situation on the Korean Peninsula and continuously promoting the political settlement of the Peninsula issue. 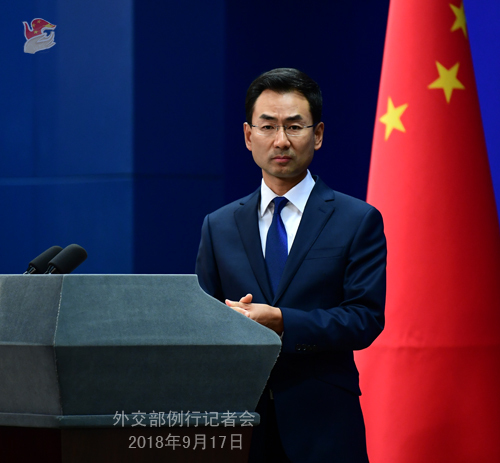 China will continue to fully support the ROK and the DPRK in improving their relations and contribute to achieving the denuclearization of the Korean Peninsula and the lasting peace and stability of the Northeast Asia at an early date. Q: According to reports, recently the Laos and Cambodia reached important consensus on resolving the disputes of their borderline territories, including conducting joint patrols and ensuring no stationing of troops or residents and in the disputed areas. Cambodia has withdrawn troops from the disputed areas. What's your comment? A: As a good neighbor and friend to both the Laos and Cambodia, China always supports the two sides in properly resolving disputes through negotiation and in the spirit of peace and friendship. We are also pleased to see that the two sides have recently reached consensus on relevant issues. Q: Japanese Defense Ministry said today that a Japanese submarine held a military exercise in the South China Sea for the first time on September 13. Now the submarine is on route to Cam Ranh Bay in Vietnam, the first time that a Japanese submarine has been there. What is your comment? A: Currently, the situation in the South China Sea has stabilized and taken on a good trend. China and ASEAN countries are committed to promoting the consultations on the Code of Conduct in the South China Sea, strengthening the maritime practical cooperation and properly handling their differences. We urge the relevant non-regional country to respect the efforts made by the regional countries to peacefully resolve the South China Sea issue through dialogue, act cautiously and refrain from doing anything that will undermine regional peace and stability. Q: The Wall Street Journal has reported that China might be considering skipping out trade talks if the US was to bring in the next round of tariffs. Could you comment on that? A: With regard to the China-US trade issues, last week my colleague from the Commerce Ministry and I myself already responded to it. I would like to stress two points once again. Firstly, if the US imposes any additional tariffs on China, we will have to take necessary countermeasures and resolutely safeguard our legitimate and legal rights and interests. Secondly, the escalating trade disputes serve the interests of neither side. We always believe that dialogue and consultation on the basis of equality, good faith and mutual respect make the only viable way out for the China-US trade issues. Q: Do you have any details on China-Nepal military exercises? A: I would suggest that you refer this question to the military. Q: Could you comment on the incident of Chinese tourists that happened in Sweden recently? After the release of the video of a Chinese tourist and his parents being removed from the hotel, there has been quite a strong response from the Chinese government. I wondered why this response was made and if this was in any way related to the case of Gui Minhai? A: Apparently you have been following the incident closely. At midnight on September 2, three Chinese tourists, two elderly ones included, were brutally treated by the Swedish police in Stockholm, Sweden. After the Chinese citizens involved reported that to the Chinese Embassy in Sweden, the Embassy and the Chinese Foreign Ministry have lodged representations with the Swedish side, asking them to conduct a thorough investigation into the case, give a timely response to the legitimate request of the Chinese involved and inform the Chinese side of the relevant situation as soon as possible. By far the Chinese side has not received any feedback on how the investigation is proceeding from the Swedish side, and the Swedish police still has not responded to the Chinese Embassy's request for a face-to-face communication. This is inconsistent with diplomatic and internationally-accepted practices. We again urge the Swedish side to take China's concerns seriously and take concrete measures to safeguard the security and legal rights and interests of Chinese tourists. As to the case of Gui Minhai you mentioned, China's position on that remains clear and unchanged.